I come from a family history of longevity. 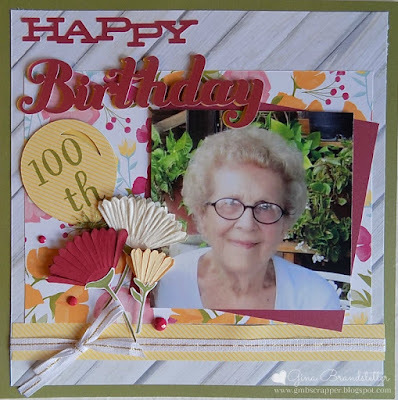 Yesterday, we celebrated my Grandma's 100th birthday!! (Her actual birthday is really tomorrow - Monday, June 19th). My Great Grandma (Grandma's mother) lived to 105 so it was no surprise to us that my grandma would strive to do the same! So of course, we had to throw her big a party!! Family from all around came by to wish her a Happy Birthday. I wanted to do something special for my Grandma and give her something she would enjoy - looking at pictures from the past and reading everyone's birthday wishes! 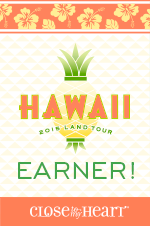 I took an idea from fellow consultant Karen Pedersen. Karen shared a guest registry she created for her son's wedding that was an album with layouts that the guests could sign. What a beautiful gift. So, I took Karen's idea and created a similar type album on a smaller scale. I created 8x8 layouts and included pictures of Grandma through the years. We had a special table set up, where I placed a couple of layouts on the table at the same time. As the pages filled with signatures and notes, I would change them out with other layouts. Now after the party is over, Grandma can enjoy the pictures and sweet notes over and over. Here are the layouts I created with some specific notes about some of the pages. Enjoy! 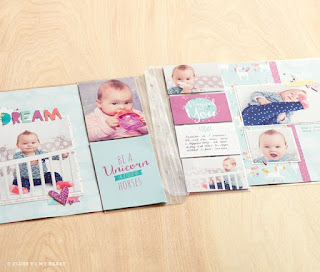 For this album, I used last year's Scrapbooking Month special paper - Happy Times. I had just enough scraps left that I was able to use most of what I had left! You will see, that with this type of album, you don't need ALOT of extra papers but I did use ALOT of cardstock! The "Happy Birthday" and the balloon were both cut from the Artiste Cricut Cartridge (now retired). I dug around in my stash and found some paper flowers from years ago! These were big round flowers that I folded in half and then folded in half again! I used the mini staple to hold the folds together. The stem is from the Happy Times stamp set! 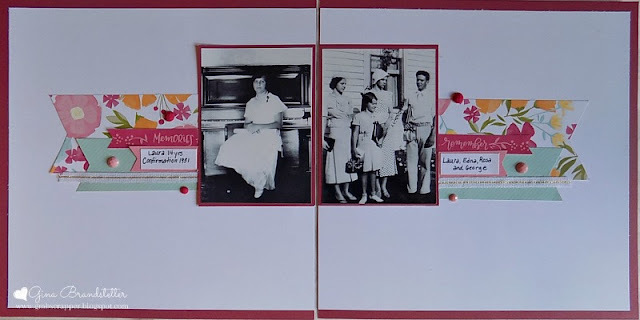 For all of my pages I used an 8x8 piece of cardstock for the base page and layered it with White Daisy cut to 7 1/2 x 7 1/2. Since the pages are smaller I wanted to allow plenty of white space for the signing area so all of my pictures are either 3x4 or 4x3 in size. 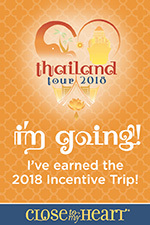 Originally I was only going to have the pictures with no headings or names... but as I thought about it, I knew that eventually this album would end up handed down so adding names and dates where I was able became very important. The flowers stamped on this layout are from the Happy Times Stamp set that was exclusive to National Scrapbooking Month in 2016. I used Canary and Glacier Inks. There are a couple of pieces on this layout that are from my stash...... The Glacier Heart washi tape and the Glacier Thick Twine. This layout is one of my favorites. My Grandma was a quilter and she had a group of ladies at her church that she quilted with. Since it was something she loved to do I wanted to be sure to include a picture in her book. I decided to piece together the pattern papers like a quilt for this page. I also tied little knots of twine and added with a few wooden buttons. Here are more paper flowers and a butterfly I found in my stash. Perfect Accent! 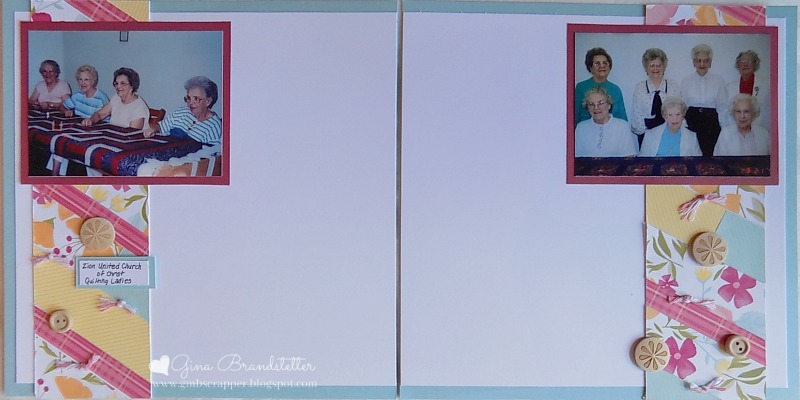 I ended the book with a layout of Grandma and husband Ed. The picture on the left is a trip they took a few years ago to Venice, Florida. I love how happy they look. The picture on the right is probably one of their more recent photos in their new home. After living on the family farm all her life (the farm had been in the family for over 100 years), she sold it to move to town. I hope this Guest Book will inspire you! The concept is a wonderful idea for creating a keepsake - whether for a wedding, milestone anniversary birthday! 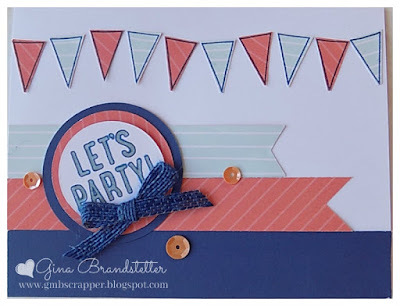 Today I'm going to share with you one of our Workshop Your Way Cardmaking Kits - Let's Party! 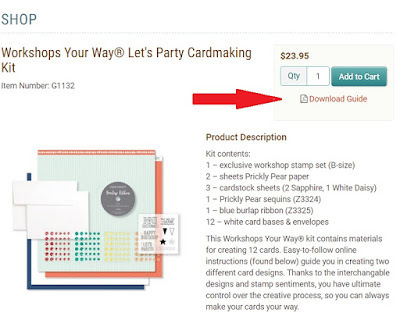 I love these kits because you get everything you need to make 12 cards (just add your ink). 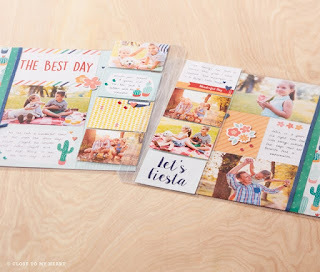 This kit includes 12 cards and envelopes, Burlap Ribbon, sequins, paper and cardstock, and an exclusive stamp set that you will see ONLY in this kit! 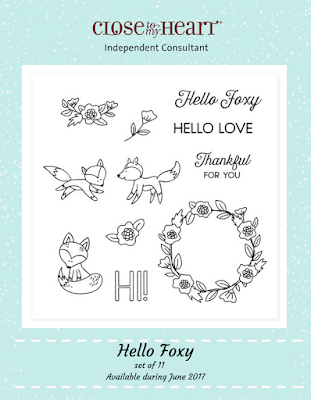 There are even FREE instructions that guide you through the cutting and assembly of the cards that can be downloaded from my shopping website. I like to create a few of the cards as shown in the guide. 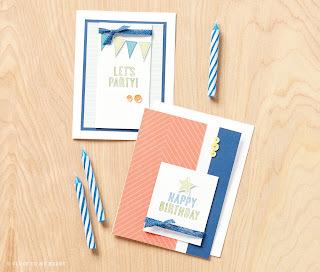 Then I like to venture out on my own and see what kind of design I can come up using the stamp and leftover supplies. 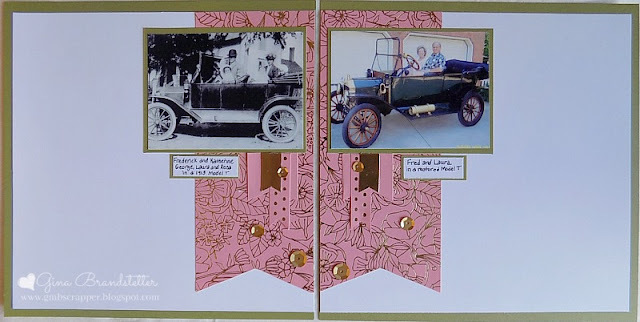 Here are two cards I created using the supplies in this kit. 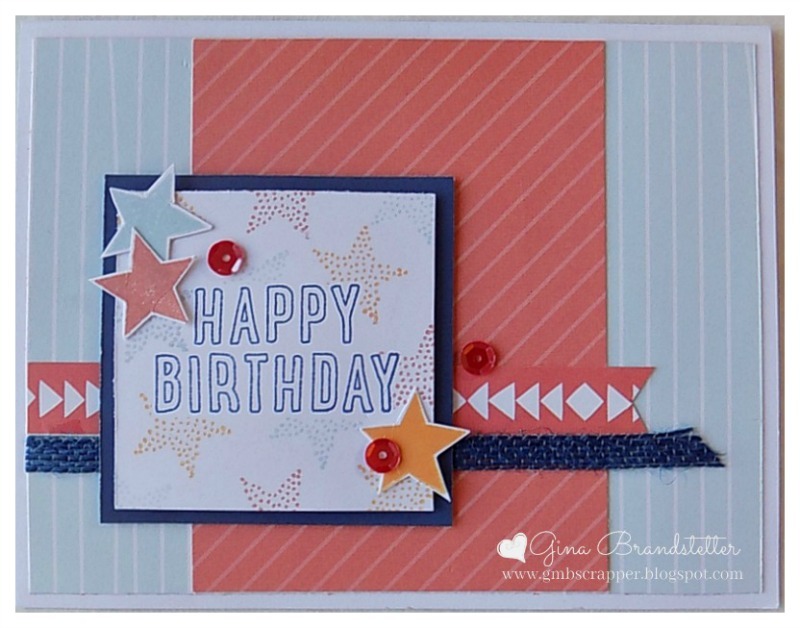 I love the background stamping I did with Happy Birthday. I used the Masking Technique to get this look. First, I stamped Happy Birthday on the White Daisy Cardstock. Then, I stamped "Happy Birthday" on a sticky note and trimmed it out really close. I placed the stamped sticky note right on top of my Happy Birthday on the white cardstock. (I like to use sticky notes because the paper is thin and the sticky on the back holds it in place). Next, I stamped the stars in Tangerine, Glacier and Sorbet all over. You can see where some overlapped the "Happy Birthday" but because I used the masking technique, it looks like the sentiment is in front of the stars. For this card, rather than stamping the pennants directly onto the card, I stamped them onto the pattern paper and cut them out. I used my ShinHan Touch Twin Markers to color inside the "Let's Party!" sentiment. To get the Glacier color with my markers, I used Warm Grey 4, Turquoise Blue and the Blender (in this order). 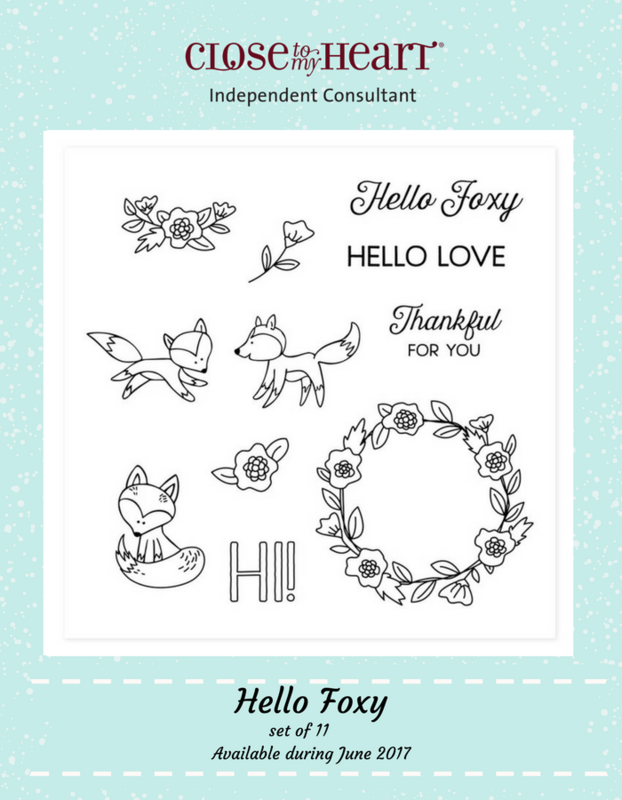 There are endless options with this stamp and I still have plenty of paper and accents left to create even more! Order YOUR Workshop Your Way Let's Party Cardmaking Kit (G1132) today! We've Got You Covered - Buy 1 Get One Half Price Albums! 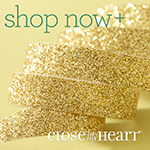 During the month of June, Close To My Heart is offering a Buy 1 Get 1 half price album special! If you have previously purchased one of our My Legacy Album in the last year, then you KNOW how beautiful they are! 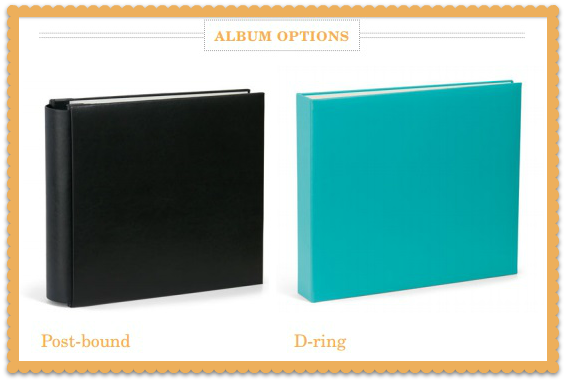 We have two types of albums to choose from: D-ring and post-bound. Both feature sturdy interiors, top quality hardware, and beautiful faux leather exteriors in a variety of colors. 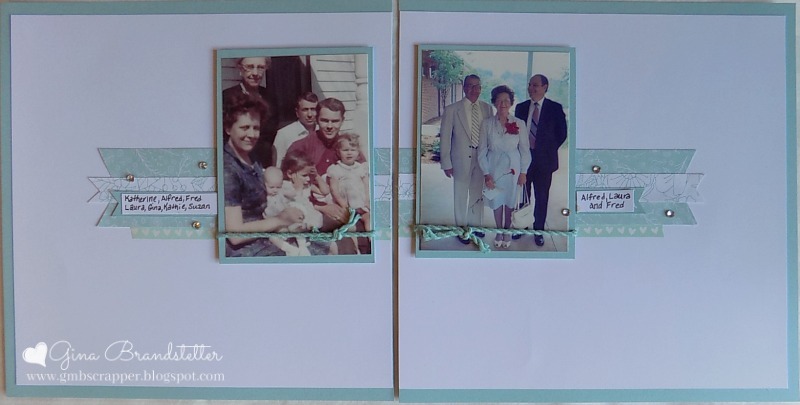 Our albums are built to keep your memories safe and on display for years to come. What is the difference between Post Bound and D-Ring? 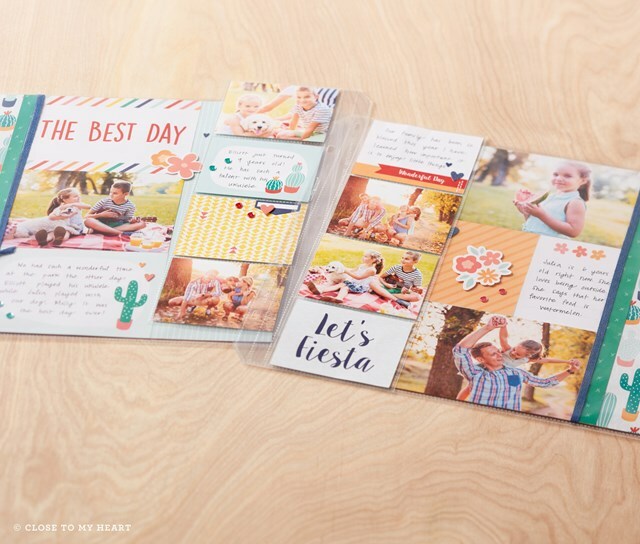 The Post-bound albums display layouts seamlessly with no gap between the pages for a professional, polished look. It works best with our spine expanders, our traditional Memory Protectors™ with lay-flat seams, and our new Pocket Plus™ Memory Protectors. 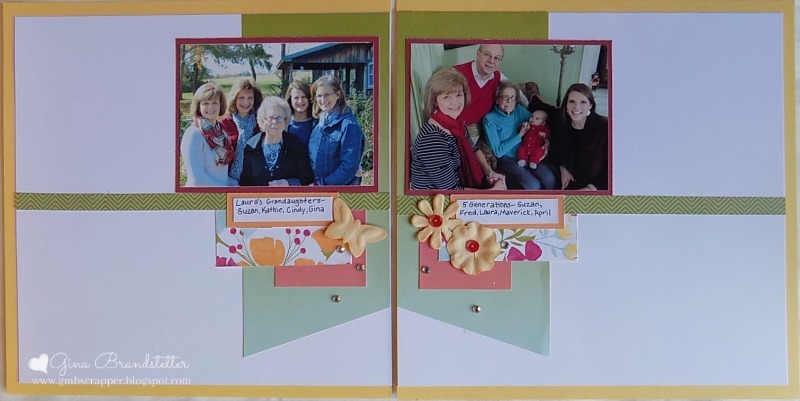 A hidden binding system with handles for loosening and tightening posts makes adding pages to the album easier. The D-ring album is the queen of versatility. 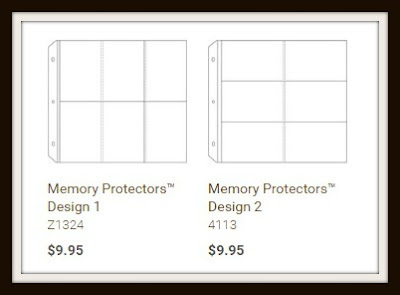 Use it with any of our Memory Protectors, including the pocket Memory Protectors designed for Picture My Life™ cards. Pages can be added and removed quickly and easily, and the durable steel D-ring binding keeps everything securely in place. When you purchase our albums, don't forget to add Memory Protectors! We have several different options of Memory Protectors available. If you prefer pocket scrapbooking, we offer five different designs of divided Memory Protectors with varying pocket sizes. These are best used with our D-ring My Legacy albums. Designs 1 & 2 feature pockets exclusively in 4" x 6" size. Designs 3, 4, and 5 feature pockets in 4" x 6" and 3" x 4". We also offer a Variety Pack that includes an assortment of designs 3, 4, and 5. Each pack includes 10 protectors. 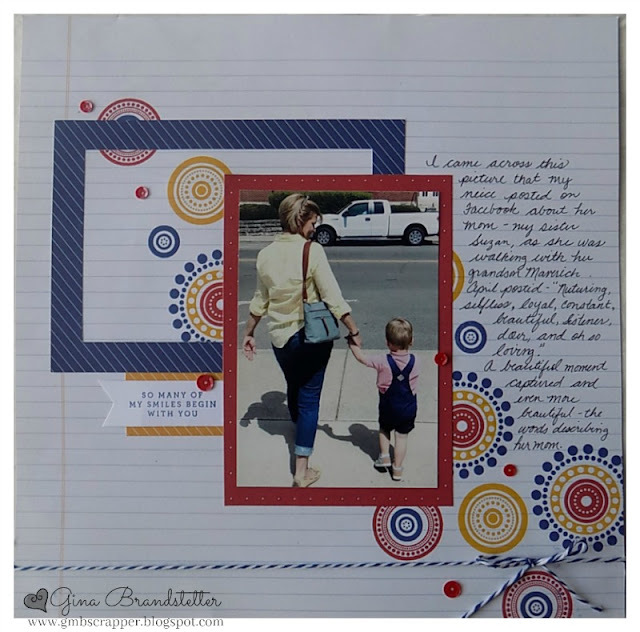 If you prefer to showcase classic 12" x 12" scrapbook layouts in our post-bound My Legacy albums, side by side with lay-flat seams, we offer both top load and side load Memory Protectors. 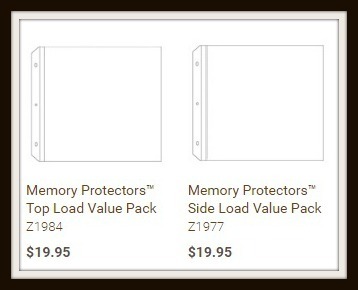 We also offer Strap Side Load Memory Protectors for those who prefer a strap-bound album. 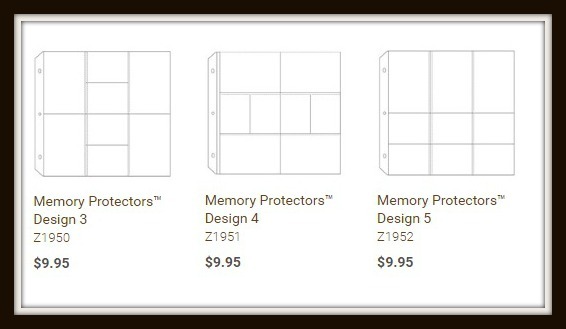 In addition, we also offer our line of Pocket Plus Memory Protectors. 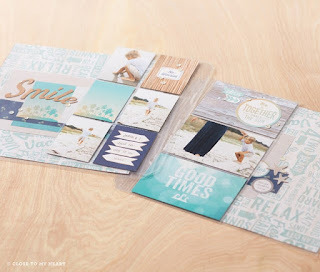 These provide the opportunity to add extra photos or artwork to layouts without creating additional 12" x 12" layouts. They feature a full gutter, which allows them to lie flat in post-bound albums. 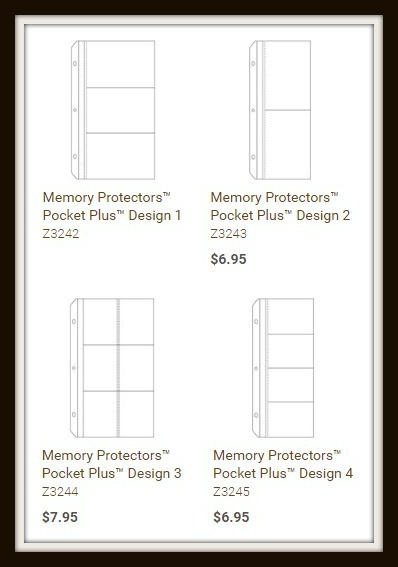 The Memory Protectors Pocket Plus are offered in 4 different designs, each of which includes 10 protectors. 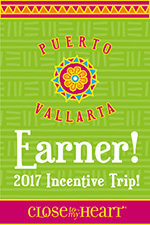 Designs 1 and 2 feature pockets exclusively in 4" x 6" size while designs 3 and 4 feature pockets in 3" x 4" size. 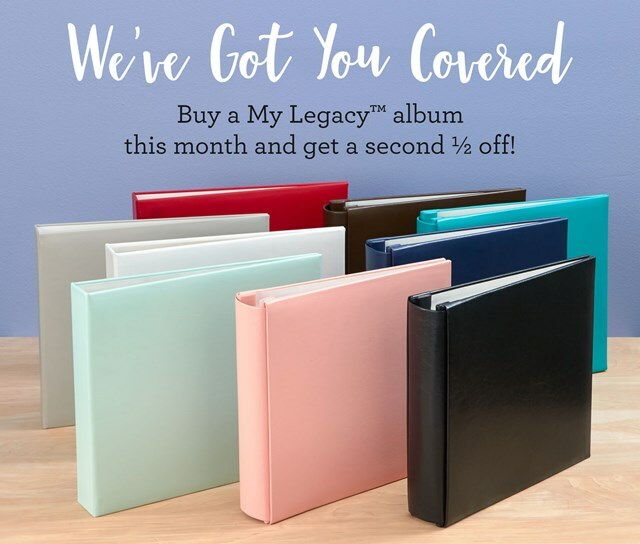 Our Album special is going on ONLY during the month of June!! Albums will be While Supplies Last during this campaign so be sure to order yours early to ensure you get the style and color you want! They will go fast!